Overall cleanliness in schools and universities affects student and staff health including the spread of germs and infection, allergies, and bug and rodent infestations. Absenteeism also impacts student learning and achievement, affecting student stress levels when infection or other environmental factors cause them to miss class. An effective cleaning and maintenance program will keep your school or university looking its best and students, staff, and visitors will notice and appreciate the difference. Why Choose the Buckeye Eco Proportioning Program? 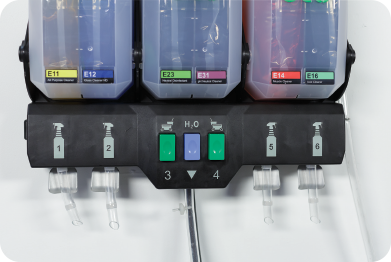 The Buckeye Eco Proportioning Program offers push-button proportioning for ease of use, making it virtually automatic to properly dilute products before cleaning. 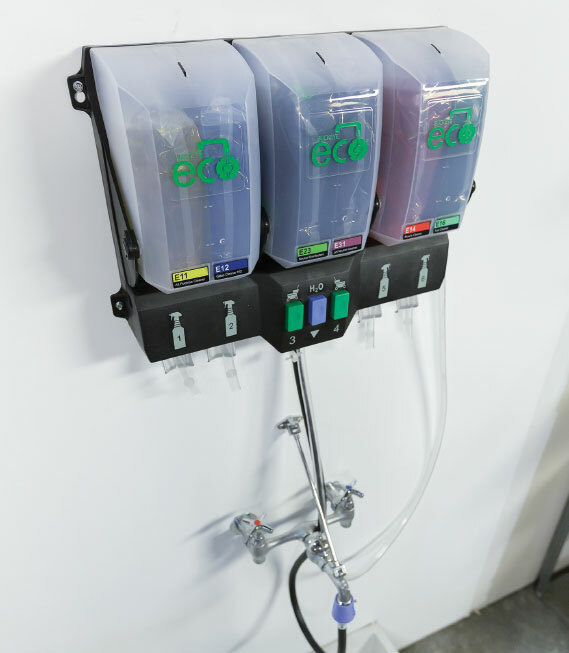 The Eco proportioning units, packaging and chemistry are economical, ecologically friendly, reliable, simple to use and designed for your school or university to achieve maximum return on your investment. 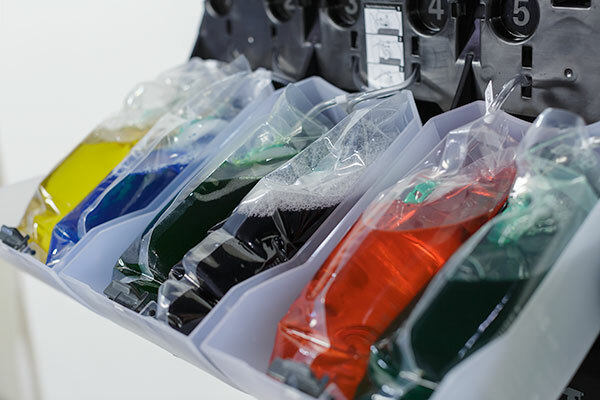 You can customize the Eco program considering your school or university's space, how many products you will dilute, cost, and whether or not your products need additional security. 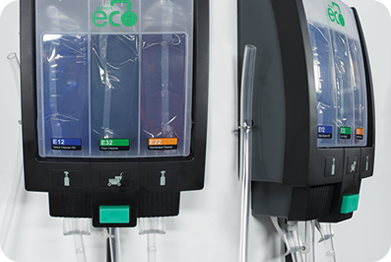 Manufactured with proprietary technology, the Eco proportioning unit’s innovative design and Eco super concentrated products produce maximum efficiency. 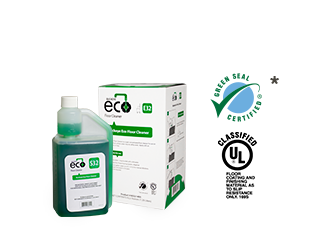 Eco All-Purpose Cleaner is a Green Seal™ certified cleaner for use on hard, nonporous surfaces. 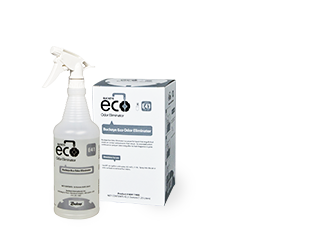 Eco Glass Cleaner HD’s non-streaking formula contains no alcohol, butyl or ammonia, and is safe on all glass, windows, mirrors, Plexiglas®, and more. 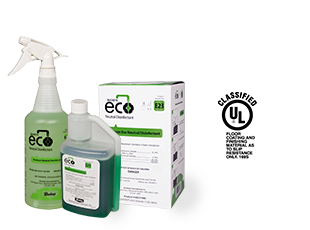 For light spray and wipe general purpose cleaning, Eco Multi-Purpose Glass Cleaner is Green Seal™ certified and its non-streaking formula contains no alcohol, butyl or ammonia, and is safe on all glass, windows, mirrors, Plexiglas®, and more. 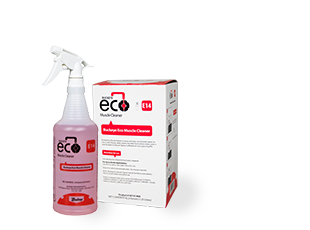 Eco Muscle Cleaner is the ultimate spray and wipe cleaner to quickly remove graffiti, ink, permanent marker, grease, oil, and other stains from nonporous surfaces. No rinsing is required and no residue is left behind. 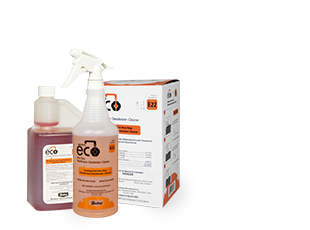 Eco Hydrogen Peroxide Cleaner is a Green Seal™ certified, all-in-one cleaner/degreaser boosted with hydrogen peroxide, and is non DOT corrosive. 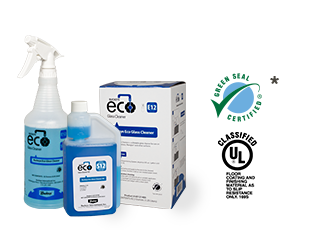 Eco Acid Cleaner is Green Seal™ certified and designed to remove hard water deposits, standing water rings, and soap buildup from multiple surfaces. Eco One-Step Disinfectant is a heavy-duty quaternary disinfectant, cleaner and deodorizer with a broad spectrum of kill claims including HIV-1 Virus, HBV, HCV, Norwalk Virus, and MRSA. 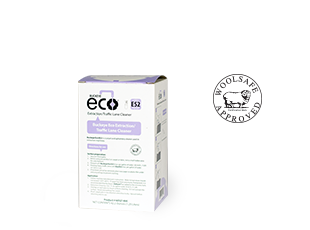 Eco Neutral Disinfectant is a multi-purpose, germicidal detergent that has a broad spectrum of kill claims including HIV-1 Virus, HBV, HCV, and MRSA. Its pH neutral, no-rinse formula is effective in hard water. 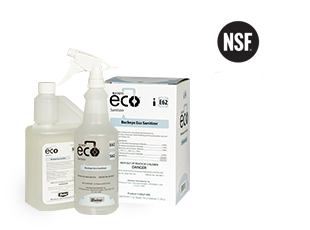 Eco pH Neutral Cleaner is Green Seal™ certified and effectively removes dirt, soils and greases from all hard surfaces, and will not leave dull film behind. 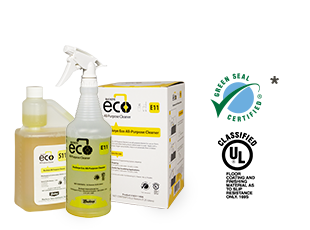 Eco Floor Cleaner Fragrance-Free is a Green Seal™ certified cleaner that is pH neutral when diluted, and will not damage floor finish. 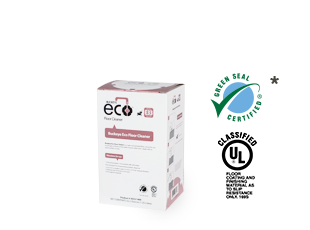 Eco Floor Cleaner is a superior Green Seal™ certified cleaner that is pH neutral when diluted, and will not damage floor finish. 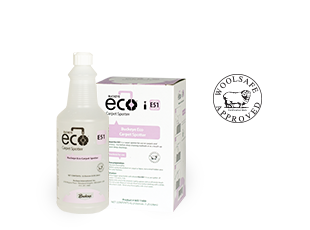 Eco Odor Eliminator eliminates odors on contact and prevents their return. Its extended action continues to conquer odors long after its fresh fragrance is gone. 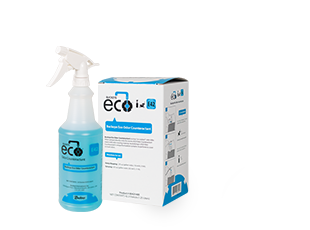 Eco Odor Counteractant is a liquid odor counteractant that chemically reacts on contact with urine, feces, food waste, and other foul-odor substances to eliminate odors. 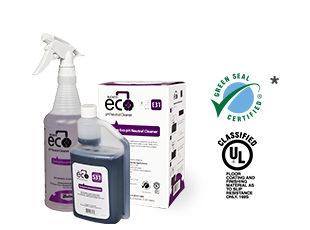 Eco Carpet Spotter is a concentrated full spectrum spotter, effective on both oil and water-based stains. Its encapsulation technology prevents re-soiling. 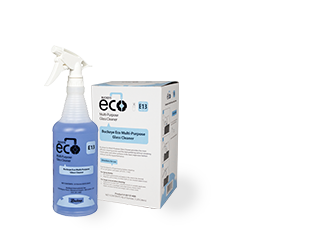 Eco Extraction Cleaner is a highly concentrated, hot water carpet extraction cleaner. Its chemistry bonds with the oil, grease, dirt or other soil and removes it quickly with the aid of hot water. It is effective on oil and water-based soils, is low foaming, and leaves no residue to promote the re-soiling of carpet fibers. 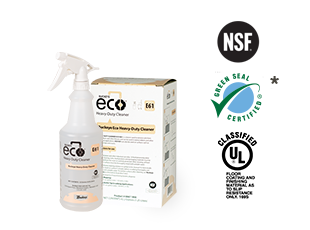 Eco Heavy-Duty Cleaner is Green Seal™ certified and removes soils from walls, floors, and fixtures as well as food processing surfaces such as saws, grinders, baking pans, grills, and ovens. It is formulated for superior cleaning and soil suspension, and works in both hot and cold water. 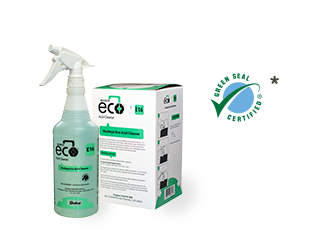 Eco Sanitizer is a super concentrated sanitizer for walls, floors and fixtures — to include food processing and preparation surfaces. 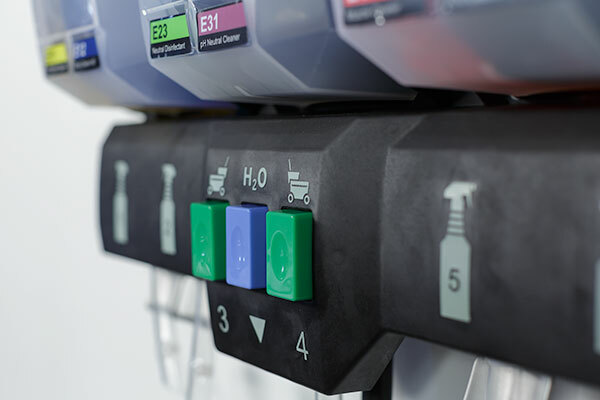 It is EPA approved to deliver an accurate sanitizing solution at a range of 200 ppm. 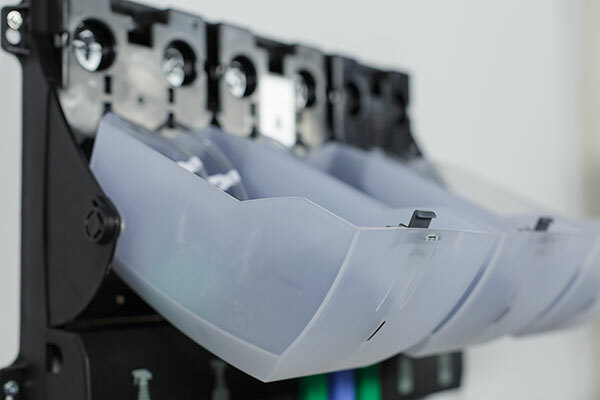 Contact us to test the Eco Proportioning Program at your school or university.